Business collection including company fundamentals, investment reports, industry rankings, profiles, market share data & company histories. Full text coverage in all disciplines of business, including marketing, management, MIS, POM, accounting, finance and economics. Covers more than 2,300 journals, including full text for more than 1,100 peer-reviewed titles. Contains citations and abstracts to economic research dating back to 1969 with full text for more than 480 journals. Business, Economics, Finance with brief information on 15,000 companies covered by Hoover's. Detailed, accurate and comprehensive global company database, includes full-text company profiles, industry information, country analysis, annual reports, equity reports, competitor analyses, and fact sheets. Covers regional business publications, providing local and regional coverage of business activity not always found in national and international publications. Updated news and market research in all aspects of the sports industry; equipment sales, facilities, licensing, etc. A catalog of books and other materials held by over 10,000 libraries world wide. SIC stands for Standard Industrial Classification code and NAICS stands for North American Industry Classification System. The United States Dept. of Commerce uses these codes to classify every company into industries and products. The SIC codes are no longer officially in use. The NAICS codes were created to both improve on and replace the SICs and to meet the requirements of NAFTA. However, in many business research databases you will likely see both SICs and NAICS in use. Several Ryan-Matura library databases can help you determine the SIC or NAICS for a particular company. Knowing a company’s SIC/NAICS code will help you better understand that company’s industry and can also be a helpful database navigational tool in gathering additional industry information. Keep in mind that many companies, particularly large conglomerates operate in multiple industries and therefore list many codes. 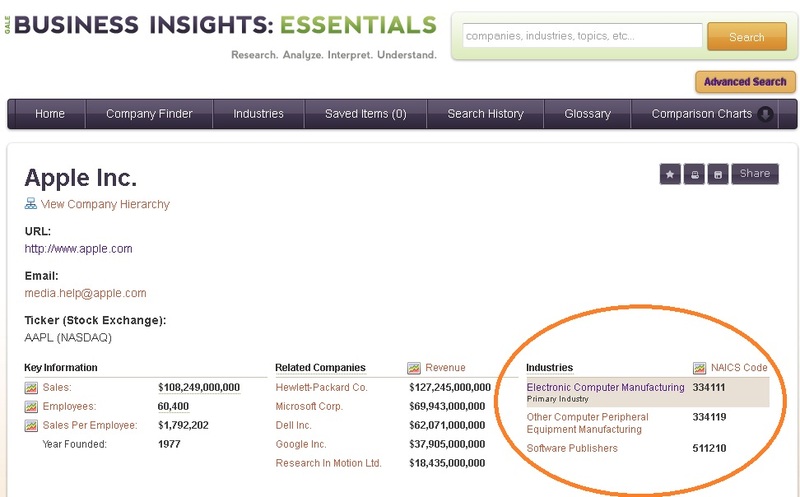 The example below shows you where to find SIC and NAICS codes from Business Insights: Essentials. Search for your company, once you pull up the company profile, you will see the NAICS codes listed on the right side of the page.